Despite summer holidays, we have initiated several new projects as well as moved to the final stages in a few of those already underway. One of the highlights is the B2B platform for one of the largest distributors of construction, workshop and welding equipment in Poland and a complete system for an automotive company which after the analytical stage is now being implemented. Among the most interesting trends we observed both on the market and when developing new systems, we can distinguish the penetration of the B2C related features, to the B2B systems. Apart from adapting an increasing number of functional solutions, it is also worth to highlight all aspects related to the usability and appearance of the systems. Currently, B2B systems, apart from their natural business features, are also characterized by easy management and ability to quickly adapt to new market expectations. At the beginning of July, i-systems invested in a company specializing in blockchain technology. GamerHash, is a solution that uses the unused processing power on users’ computers. Currently, it is mostly used for legal mining of cryptocurrencies, but in the future it will be also used for CGI rendering or machine learning. In practice, this means that the shared processing power can be used to process animations and scenes using special effects, as well as improve the the data acquisition for the needs of the self-learning processes of computer programs. 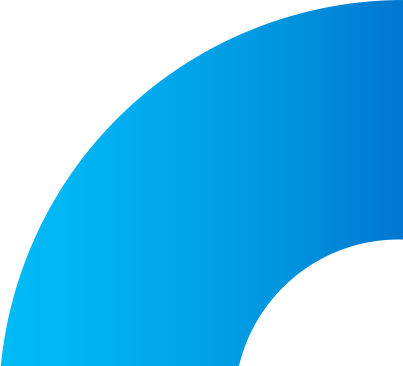 In addition to the direct investment, i-systems will also support GamerHash technologically. The company will use its experience in the area of transaction systems and will be responsible for expanding the e-commerce part of GamerHash. Tar Heel Capital Pathfinder made their investment before as well. During the last quarter, i-systems team, represented the company in several events that blend business and technology. These were: InternetBeta, Shopping Centre Forum 2018 CEE Exhibition & Conference and E-commerce Expo in London. If anyone missed us at any of the previous shows, we’ll be joining the VI Forum of Retail Channels 360, which will be held on 18 and 19 October in Warsaw, and at the Fashion Business Congress, planned for 25 October in Łódź. Both conferences will feature our presentations, focused on the modern day e-commerce systems. We will be also present at the eCommerce Fair in Warsaw, scheduled for November 7th. We encourage you to catch up with us there! The biggest internal change, was the one related to the organization of work of people involved in the implementation and development of the systems. We have been preparing for this change for a long time, so that the process would be smooth for all the involved parties. From now on, most of the work related to the IT-related projects will be carried out by the so-called contexts. The background behind the creation of contextual teams is related to the … termination of the research and development department. This department consisted of highly skilled and competent people who where not, however, directly involved in any project. This organization had its advantages and disadvantages, both for internal product development and for the team members themselves. The change in our sales model associated with the launch of the CI-based solution has also affected the implementation and development model itself. In this model, the new system is implemented by many contexts, each one of which has the best knowledge of the specific issue and the product to which it has been assigned. 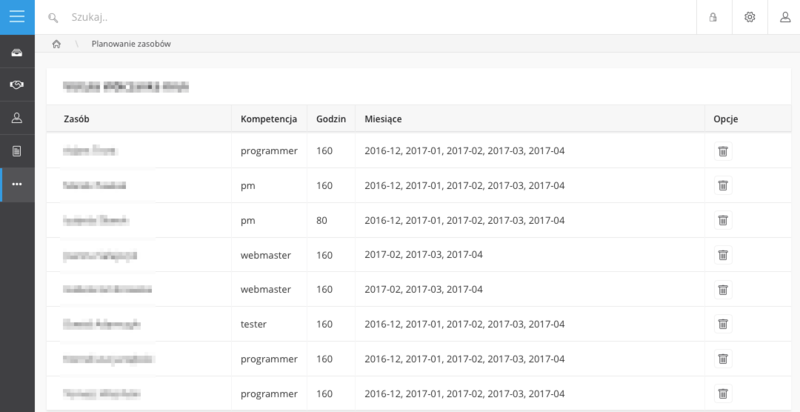 Thanks to this, the knowledge in our organization is now more aggregated and arranged in an even more accessible way than before. Such work organization significantly accelerates the implementation process and improves the quality of our solutions. Current context teams include Product Information Management, integration, order management, CRM, RMA, GUI, promotions and Shopapp app. We will be posting more about the contextual teams on our blog soon. As our quarterly summary shows – the last months have been really intensive for us. Last but not least, we are proud to announce that at the beginning of September our company was awarded with the „Highest Quality” title in the Ambassador of the Polish Economy 2018 competition, organized by the Business Centre Club. If you don’t want to miss the next summary of key development activities of i-systems, we invite you to subscribe to our newsletter. Ten wpis został opublikowany w Investor Relations, Quarter summary dnia 19 października 2018 , przez Marcin Rutkowski. Upcoming holidays do not mean e-commerce actions will slow down. Actually, on the contrary, it is the best time to prepare and implement new solutions before the peak period for most e-commerce companies. Here is an overview of the last quarter in the daily life of i-systems. The second quarter of the year brought a number of new contracts. Except for those strictly connected with online sales and customers switching to continuous integration, it is worth paying attention to new analytical projects. The analysis was made for a company specializing in thermal insulation distribution and a company that supplies tools and machines for construction and heavy industry. These contracts show great demand related to trade and distribution solutions. Among the most interesting trends observed on the market and while working on particular systems, we can distinguish widely understood integrations. Our recent work in this field covered, for instance, warehouse and accounting programs of the Asseco group. A large part also concerns and will concern integration with the marketplace, which is an external system that aggregates offers from different places. Integration with marketplace means a couple of challenges, such as two-way inventory integrations or automatic display and removal of offers, according to the previously adopted sales logic. In the second quarter of the year, representatives of i-systems participated in several business and technology events, such as Retail Marketing Forum, XIV Targi eHandlu [en. XIV E-commerce Fairs], E-commerce Innovations, E-commerce B2B and E-commerce Universe. During enlisted events, we focused on educating the market and presenting the effects of research & development team. Continuous integration was the most frequently discussed topic. It is a response to quickly changing market expectations, as well as the desire to have a constantly developed and up-to-date e-commerce system. Among the internal projects developed in the last three months, the Progressive Web App can be distinguished. This solution is designed to provide the customer with the best experience, regardless of which device he or she uses. This idea at first glance has a lot to do with Responsive Web Design. However, the solution has a deeper purpose than just displaying things correctly on every available device. Its main goal is to significantly improve the efficiency and speed of the system, by changing the organization of tasks performed by its frontend and backend parts. At the beginning of April, i-systems was awarded in the FT1000 ranking. The ranking is being prepared by the Financial Times – one of the most opinion-forming global economic and financial magazines in cooperation with Statista Research Institute – a leading provider of data on markets and consumers. The company’s place in the ranking is determined by the increase in revenues that the company reported in the years 2013-2016. In addition, it is worth mentioning the appearance of i-systems in the ranking of the 500 best providers of B2B solutions from Poland and Ukraine, responsible for the design and development of IT systems. 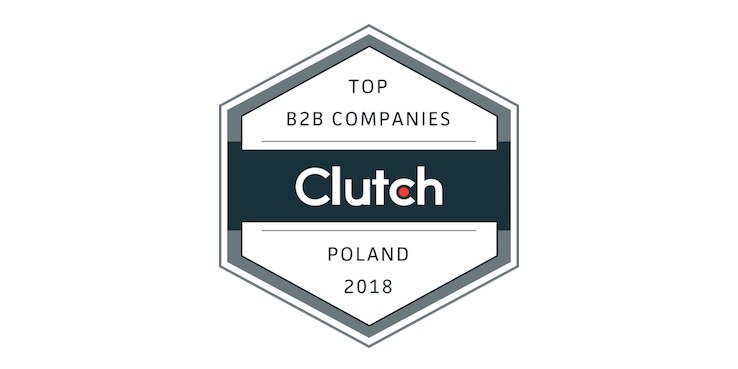 The ranking was prepared by the Clutch agency. Ten wpis został opublikowany w Investor Relations, Quarter summary dnia 1 sierpnia 2018 , przez Marcin Rutkowski. The most interesting projects from the first quarter of the year, mainly concerned B2B solutions. One of them is the system for one of the largest importers and distributors in the Polish HoReCa industry. The second project concerns a company dealing with the production and distribution of chimney and ventilation systems. The scope of this system includes both B2B and B2C solutions. Another of the key projects concerns the omnichannel solution for one of the well-known Polish brands, with approximately 100 offline stores located throughout the country. In January, work for the automotive sector has also begun. Details of the solutions will be published in the next quarterly summaries. A large part of the most important consumer ratings of online stores relates to time and quality of delivery. On the other hand, more and more often companies do not want to freeze revenues for storing products. Dropshipping meets those expectations. Dropshipping is a warehouse policy model in which the shipment of the order to the customer takes place on the side of the producer, distributor or wholesaler. While the role of the online store is focused on activities aimed at encouraging purchase, order acceptance and redirection of information to a business partner for the purpose of shipping. The adoption of such model has many benefits. It is a way to expand the offer of an online store with an assortment of many manufacturers, and also it allows it to reduce the costs associated with the storage and transport of goods. In order to implement dropshipping in e-commerce, it is initially required to download information about products from the business partner’s website and to map them to the sales system. This process must be repeatable because the manufacturer’s product range changes. Then, data on categories, VAT rates and margins for individual products or entire categories are verified. In addition to the standard solution, some brands implement and use the so-called reverse dropshipping. It means selling brand’s own products to other online stores, which are then selling them to the target customers. This sales policy is a good choice when the brand wants to exist on the foreign market through its partners. Part of the company’s activities is aimed at people interested in working in i-systems. Among such activities, in the last three months, „Programming holidays”, for those who wanted to start an adventure with IT can be mentioned, along with the study visits. Recently, we hosted students from WSB in Chorzów and Silesian University of Technology in Gliwice, Katowice department. In the last quarter, the company’s representatives were also present at industry events. These included E-commerce EXPO in Berlin and the E-commerce Trends conference. During those events, ideas and solutions have been presented that will have a major impact on e-commerce in the near future. The Research & Development team is working on the development of Continuous Integration capabilities. Creating systems in this method allows faster launching of individual functionalities or even the entire systems. An example of such an action is the launch of a ticket booking system for Termy Bania, which took only a month. We are also working on client’s transition to CI solutions. The Polish company – Dalia – decided to take such step. Another project that is being developed, is a web application for an online store, built using Angular tools in RWD and PWA technology. The logic of these works boils down to making the storefronts independent of the server part. The aim of the activities is to increase the client’s positive experience by improving the efficiency of the system and enabling the easier introduction of new mechanisms. The web application is also built based on the Continuous Integration method. In the first quarter, the company’s „hall of fame” expanded by two positions. The first of these was the nomination in the Mobile Trends Awards competition in the „m-commerce” category for a mobile application, created for the R-GOL.com brand. In addition, at the beginning of March, Inc. Magazine published a ranking of 5000 fastest-growing private companies in Europe. In this year’s ranking, i-systems was listed for the first time, with a growth rate of 183%. Details of the ranking can be found here. Ten wpis został opublikowany w Quarter summary dnia 13 kwietnia 2018 , przez Marcin Rutkowski. Another quarter of 2017 has come to an end. As announced, we present the most important events from this period. Over the last three months, six new projects have been started. The companies that decided to begin a cooperation with i-systems, operates among others in furniture, cosmetic, fashion and sanitary industry. A company from chemistry sector has decided to carry out a business analysis. This shows the broad spectrum of modern B2B e-commerce solutions. At the beginning of the Q2, e-commerce systems for Vistula Group joint-stock company have been launched. The scope of works included new sales platforms for brands: Vistula, Wólczanka and W.Kruk. More information on those implementations will be published in the nearest future. Increasingly important in B2B transactions are tools that are typically associated with the B2C sales model. They can build the loyalty of the target customer as well as increase satisfaction from the daily use of the systems. Examples of such solutions introduced in the second quarter of the year in company’s customer’s systems are: the ability to create personalized price lists for wholesale customers, the optimization of order fulfillment in a furniture company or multicart module in a company specializing in wholesale of fasteners. Another trend is the development of sales through the use of external network marketplace. 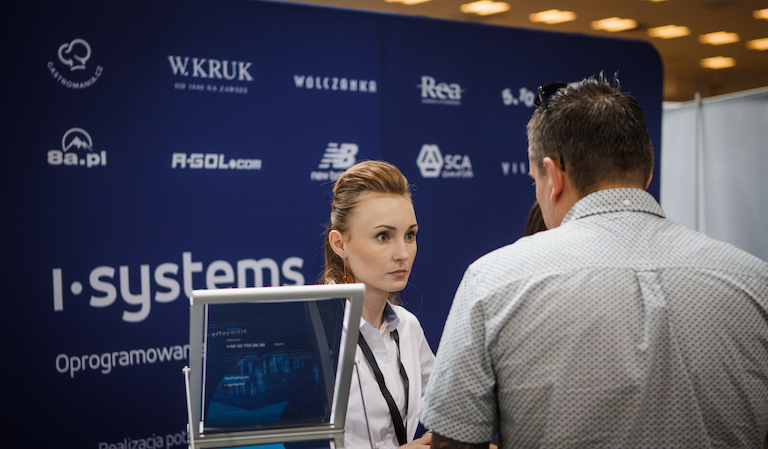 To continue the adopted strategy of i-systems development in the international markets, i-systems representatives participated in Retail Business Technology Expo in London. At the biggest retail fair in Europe, they exchanged experiences with foreign entrepreneurs and customers. 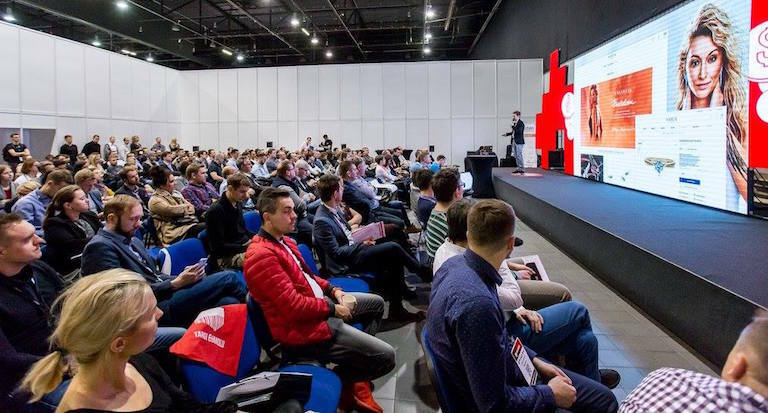 Polish conference, E-commerce Summit, has shed a new light on the progress and development of e-commerce, and during the Marketing Forum, the future of e-commerce has been outlined. The above-mentioned meetings and conferences have resulted in new business contacts. The company also develops employer branding activities. As a result of participation in job fairs in Q1, Career Days were organized in i-systems. During the meeting in April, jobseekers were not only able to see what the company’s life was like from the inside, but also talk to the current employees about their day-to-day work, as well as leave their CVs for selected job positions. These and other activities have made the i-systems team grow by 10 new people in the last three months. Further recruitment is planned. At the end of May, training on unit tests was organized for employees. Participants learned new solutions for unit testing. Moreover, scenarios for testing the upgrades of the base version of e-commerce have also been completed. Both solutions increase the quality of software delivered to the customers and are part of a long-term vision of software development. In the last quarter, a log server service has been launched. The solution is part of a modern e-commerce server infrastructure. It facilitates work on a system and raises security. Over the past three months, i-systems has been awarded four distinctions. The company was placed among the fastest growing companies in Europe, the ranking was created for the first time by the Financial Times, in collaboration with the Institute of Market Research – Statista. – Being placed among the 1000 fastest growing companies in Europe gives us a sense of well-performed everyday work. We are doing our best to make a measurable impact on the development of e-commerce, not only in Poland. Being listed in the ranking of such a prestigious magazine as Financial Times is extremely motivating for us – comments Paweł Jaczewski, CEO at i-systems. Business Center Club awarded i-systems with European Medal. It is a distinction for companies with products and services which meet European standards and are innovative in the market. The company was also honored with the title of Firma Dobrze Widziana [Goodwill Company] for its CSR activities. What is more, the i-systems research and development department directly contributed to the receiving of Innovation Initiator award. This contest was organized by the Newsweek weekly, and PWC was the content partner of the event. We invite you to read another summary of i-systems events. The next one will appear in early October. Should you not miss the Q3 summary, we invite you to subscribe to the newsletter. Ten wpis został opublikowany w Article, News, Post, Quarter summary dnia 24 lipca 2017 , przez Marcin Rutkowski. In the life of every business, also in this operating in the e-commerce sector, the beginning of the year is a very intense time. Here are the highlights of the last quarter in i-systems. The next summaries will be delivered each quarter of the year. At the beginning of the year, 6 contracts were signed with the new customers for the implementation and development of the sales systems. Four of them are related to solutions for B2B sector. These companies operate in the fields of construction, cosmetic, marketing, as well as distribution for the chemical, petrochemical, energy industries and also food industry. The work begins with a business analysis. More about i-systems business analysis can be found on our website. Based on the market observations and repetitive developments in i-systems, we will be presenting market needs and trends. In Q1 the connection between online and offline, as well as the usage of the omnichannel potential is the most important matter. At the beginning of the year, the functionalities that strengthen multi-channel sales were implemented, among others in: 5.10.15. or R-GOL, where the availability of the product at the stationary store can be checked through the online store. For the development of our own products and our customers’ systems, a larger team is needed. In Q1, the representatives of i-systems were present at the events of the Faculty of Automatics, Electronics and Informatics of the Silesian University of Technology, as well as at the Engineering Job Fair in Gliwice. Among other things, these activities led to the fact that in the first three months of this year, our team had grown by 12 people. The IT department and the software testing department has expanded the most. Further recruitment is planned, mainly in product and solutions departments at i-systems. Continuous recruitment allows for the development of software and creating new teams, designated for the implementation of specific projects. The most important change in the first quarter is full support for internal processes related to the long-term work planning for our Customers. The resource planner is integrated with all company tools and internal workflow. Planner allows reserving working time for customers who then take priority over work on the system. This tool is and will be used throughout all company work. In February, a new version of the mobile app was launched. Its most important advantage is the constant connection with the e-commerce system and its management from the same panel. The new version is now available in App Store and Google Play. More can be found on i-systems blog. New cloud resources are available for the current and new Customers. New disks and more powerful processors have been purchased, and the infrastructure has been replaced. In addition, the network has been upgraded to 10 Gbps. As a result, cloud support will be at a higher level. In order to pursue the effective support for each sector of trade, i-systems has started the cooperation with the Polish Council of Shopping Centers (abbrv. PRCH). PRCH is the largest organization in Poland, associating over 240 companies related to the industry of shopping centers and shopping streets. PRCH is a not-for-profit association that has been operating since 2003 and it is a national partner of the International Council of Shopping Centers (ICSC). – As a member of the Polish Council of Shopping Centers, we have many new opportunities. First and foremost, we want to show that it is possible to connect the online and offline worlds – states Krzysztof Jaciw, CFO at i-systems. The first implementation of the e-commerce solution for the shopping center in the CEE region is FASHION HOUSE Online Shopping. More about this implementation can be found on i-systems website. We invite you to read another summary of i-systems events. The next one will appear in early July. In order not to miss the Q2 summary, we invite you to subscribe to the newsletter. Ten wpis został opublikowany w Article, News, Post, Quarter summary dnia 14 kwietnia 2017 , przez Marcin Rutkowski.